This was hardys first traditional style compact cruiser. The 17PH stands for planing hull.The interior offers 2 berths with abasic galley and storage compartment for a chemical toilet. 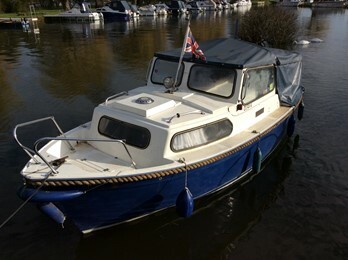 the boat is a little more compact than the highly popular 18 Navigator model.These craft featued and open cockpit rather than GRP wheelhouse, but had all the trade mark features like rope fendering.